After two very pleasant days on our very pleasant, very secluded mooring opposite Chimney Nature Reserve we cruised for seven hours to reach Lechlade. Through Rushey, Radcot, Grafton, Buscot locks, along miles of river with more twists and turns than a pubic hair, and finally to St John’s lock close to Lechlade and our first lock keeper of the day. Slightly worried about the tales of bovine boat battering told to us by the Eynsham lock keeper, I asked whether they were true. Reassured, we moored in the only free spot next to a large field between St John’s lock and Lechlade Bridge. After checking for the dreaded bullocks and noting that they were half a mile away at the far end of the field from us, rather safe than sorry, we moved Sally’s large flower pot from the bow gas locker lid to the front deck where they would be out of the crafty cows’ sight. Contrary to the lock keeper’s assurances, several boat owners emailed to inform me of their Lechlade losses after I wrote about boat eating bovines in last week’s newsletter. Cratch covers, rope and anything organic is fair game so Sally’s colourful floral display was certainly at risk. We marched through heavy drizzle to Lechlade’s Londis store, filled two rucksacks with enough food for the next week then walked quickly back to the river to check on the boat. We knew we were probably worrying unnecessarily but didn’t want to take any chances. 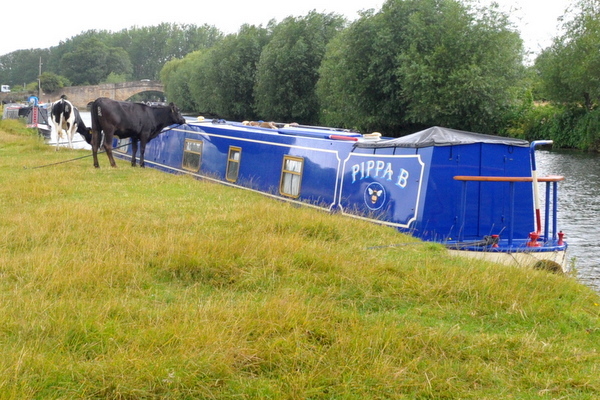 As we crossed Lechlade bridge we noticed that the bullock herd had moved closer to our boat. Much closer. We walked a little quicker. We emerged from the path under the bridge to see the young bulls reach the line of moored craft. Some of them started nibbling tasty bits of boat. I couldn’t see how close they were to ours but I sprinted along the path towards them. I reached the boat a little out of breath. A two hundred metre dash carry a backpack full of shopping didn’t do my lungs any good, but I still had enough breath in me to scream at two hungry bulls dribbling over our cratch cover and chewing the retaining straps. The skittish animals ran off immediately so, on a roll, I shouted at another half dozen herd members dining on boats either side of us. With the bullocks gone we considered our options. We’d been moored for less for an hour but already been subject to far too much attention for our liking. The animals were easy enough to chase off, providing we knew they were there. I don’t know whether cows are partial to midnight snacks but I didn’t think we could afford to take the chance. We decided to move. I didn’t want to move far. Heavy rain was falling, a stiff breeze was buffeting the boat and we’d been on the move for most of the day already. We headed for a single free mooring in the field between the bullocks and St John’s lock I had noticed on our way into Lechlade. The mooring was a little tricky to get on considering the wind which tried to push the boat back into the middle of the river, but I managed to jump off, wrap the centre line around a tree and then catch Sally as she jumped off to hold the centre rope while I hammered the stakes in. The front stake went in easily so I ran to the stern and started hammering the steel pin in the rock hard ground. I felt a searing pain in my hand, leaped away from the stake and realised that my head was surrounded by wasps. I had hammered the stake through their nest. In quick succession I was stung three more times on my left ear before I could get away. Despite the stings I was happy that the boat was secure and we were thankfully on the far side of a barbed wire fence from the barmy bullocks. Sally had our dinner ready so, after covering my throbbing bits with Sudocrem, we sat down to eat and enjoy a little peace and quiet for the rest of the evening. And then the boat lurched suddenly as something very large climbed on board. If you are already a boat owner, you’ll have experienced the sudden and unmistakable dip when someone steps on either the front or rear deck. Imagine that dip magnified by ten and you’ll have an idea what we felt. I ran outside to find a rather frisky bullock with one hoof planted on our rear deck and his mouth full of braid on braid rope. The boat lurched again when he jumped off as I screamed at him, then I screamed at his mate who was busy eating the dangling end of the tree tied centre line. At first we couldn’t understand where the animals had come from. We were right. There was a barbed wire fence between the fields next to our last and our current mooring, but what we hadn’t realised was that the bullocks could walk into the river and around the fence. At least forty were now in the small field next to us, the only boat near them in this new field. We wolfed down our food standing up at opposite ends of the boat. I had mine in the engine room guarding the boat’s rear. Sally had hers on the front deck protecting her floral display on the bow. It wasn’t the most leisurely meal we’ve ever enjoyed on board. As soon as we finished eating we moved to a bullock free zone. We dropped down through St. John’s lock and moored on the completely inaccessible overflow lock landing. We were safe from cows and out of the way of the few boaters at that time of the night wishing to use the lock. We were happy, but the dogs weren’t. They’re both very good boat dogs, but neither of them like walking on meshed grills above open water. The lock landing, the only place we could take them for a late night constitutional, was all meshed grills above open water. Both of them stood quivering on the landing for five minutes while both Sally and I tried to encourage them to have a wee. They wouldn’t, so we retired for the night then woke at dawn, checked quickly for doggie accidents then moved on to find the dogs some grass before heading back down the river away from Lechlade. I’m always thrilled when I learn something new. Since I’ve been messing about on boats, I’ve always though the phrase “GRP cruiser” referred to a particular boat’s construction and type. Over the last week on the Thames I’ve discovered that I’m wrong. I now think the phrase is actually a description of the type of person on board so, instead of a Glass Reinforced Plastic cruiser we have a Generally Rather Passive cruiser. 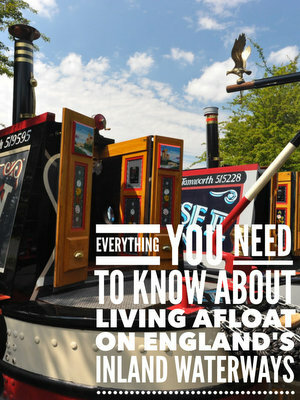 The description comes from the boat owner’s behaviour in locks. Sally and I left St John’s lock at dawn. By 9am we’d been cruising for three hours which included negotiating three unmanned locks. The Thames locks between Oxford and Lechlade are a breeze to operate, which is just as well given the shortage of keepers. The locks are slightly larger than the double locks on the Grand Union canal, but much easier to set. The principle is the same as the canal locks. Before you enter the lock, you make sure the sluices are closed in the gates at the far end, indicated in these locks by a white tipped vertical bar being uppermost, rather than a red tipped bar which tells you that the sluices are open. Then, instead of struggling to raise a stiff paddle with your windlass, you just rotate a ship’s wheel, which flies easily through your hands, until the sluice is fully open. The gates are nicely balanced too, so there’s no need to try and find half a dozen other willing boaters to help push an unwieldy gate open. One gentle lean against the balance beam from anyone weighing more than about six stone is enough to start the gate moving. Why then are so many boaters on the Thames unwilling to help? We reached the fourth of the day, Rushley lock, to find a guy with a 20’ cruiser who appeared to be struggling to work his boat through the lock on his own. I’m always happy to help a solo boater so as he stood, rather worriedly, with a rope looped around a lock-side bollard, I told him to stay with the boat while I opened the sluices and the opened a gate for him. Sally was standing back, which I thought was strange. She relishes the challenge at locks so I asked her why she wasn’t joining in. “Why are you doing all the work instead of her?” she asked, pointing to the well-dressed lady sitting at the cruiser’s helm. I could see Sally’s point. The cruiser lady seemed quite happy to let me run around for her while she relaxed and chatted to her husband. I opened one gate, her husband opened the other then he climbed on board and their boat chugged out of the lock. The lady didn’t even acknowledge either Sally or I as she passed. I know I’m not a regular river user, but we’ve now been on the Thames for a week. Our experience at Rushley lock wasn’t unusual. 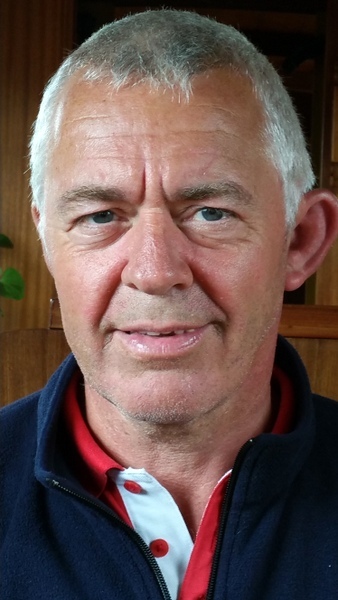 In the absence of a lock keeper – during our week on the river just six out of eighteen locks were manned – you can almost guarantee that the narrowboat crews will be the ones doing the work while more often than not both crew on a cruiser will stay on board. Let me stress, I have very little river experience, so our single week of Thames locking may have been an aberration, but omehow I doubt it. Before we left the deep and wide waters of the Thames, I took advantage of the additional space the river offered to test my engine. I know the boat has done plenty of river work in the past. The original owner used James No 194 regularly from 1977 to when he died in 1997 for cruises between the boat’s winter mooring in London and summer mooring at Calcutt Boats, often via the Thames. When he died Calcutt Boats’ owner, Roger Preen, bought the boat but didn’t have time to use it. I took James off his hands in 2010 then had to add more than a tonne of steel to the boat’s weight to over plate the disintegrating wooden cabin. Since I’ve added the extra weight, and since I’ve had the engine overhauled after nearly a decade a half of inactivity I was keen to push the engine to its limits to see how the boat handles and the engine performs now. During my seven days on the Thames, the river has been very placid with no noticeable current so I haven’t been running the engine at a higher speed than I usually do on the canals. When I reached a wide mile long straight I opened up the throttle. Unfortunately, the trial didn’t go too well. Fifteen hundred RPM is my normal canal cruising speed and is, I know through testing with numerous different apps on my iPhone, about 4mph. I increased the speed to 2,000RPM. My phone told me I was travelling at the giddy speed of 5.5mph. I edged the Morse control forward until the engine was running at 2,200RPM. My speed increased to 6mph, but then my engine temperature started to increase too. Of course, I don’t need to be able to cruise at this speed on canals but I want the extra power in reserve for dealing with river currents. I also want to take the boat over the Ribble Link to the Lancaster canal and on the tidal Trent to access the Fossdyke Navigation at some stage. I certainly want a little extra power there. I haven’t the faintest idea why the engine is overheating. The 42hp engine is capable of delivering much more power. I’m wondering whether the problem has anything to do with the exhaust. I’ve noticed the stern digs down into the water so much when I significantly increase speed that the wet exhaust is very close to water level. Is my engine’s raw water cooling efficiency being restricted? I don’t know, but it’s an issue I need to resolve before taking the boat on more challenging waters. To add to my misery on Tuesday, Sally started calling me Dumbo. She assured me that my new nickname had nothing to do with my trunk but rather my elephant like left ear. After a night of quiet seclusion close to Chimney Nature Reserve we set off on our last permitted day on the Thames. Through four wide, easy to negotiate, well maintained river locks, then left at King’s lock on to a much narrower section of the river just before reaching the suddenly claustrophobic Duke’s Cut lock. The approach to the lock is a narrow single boat width channel squeezed between half a dozen dilapidated live aboard boats on one side and overhanging foliage on the other. Just to make the lock approach even more uncomfortable, there’s no lock landing. If you’re single handing you have to push your bow up against the lock gate, walk along your gunnel so you can jump off your bow, set the lock while holding onto your bow rope, push your boat away so you can open the gate, then pull it back in again so that you can climb back on board. Once through Duke’s Cut lock and then through Duke’s lock back on the south Oxford, the canal’s lack shallow depth is very noticeable after the river. Still at 1500rpm, the boat moved much slower, dragging mud, vibrating the tiller and responding sluggishly on bends. Still, at least there’s less of a problem mooring on canals than rivers, unless you’re near Kidlington or Thrupp. Nearly all the available moorings were taken from Kiddlington to Thrupp so we passed them by before stopping for the night on a too short free space among dense bankside vegetation. No problem though thanks to our recently sharpened garden shears. After five minutes of manic cutting we had a perfect and private place to stay close to Shipton Weir lock. The next day’s cruise lasted just over an hour. By 10am we were securely tied on one of four offside moorings at Kirtlington quarry. It’s not been worked for over eighty years. It’s now a wooded nature reserve complete with a network of paths and wooden steps and bridges over and around the steep terrain. Sally left on Friday to stay with her daughter and help with the logistics of her moving both job and house so I was left to my own devices for the rest of the trip. I like a quiet life these days so left on my own I like to fill the day with walking and reading. My dinner on Friday was a superb ploughman’s eaten the deserted bar of Enslow’s Rock of Gibraltar with only my Kindle and a blaring television for company, but the culinary highlight of the week was the following day. 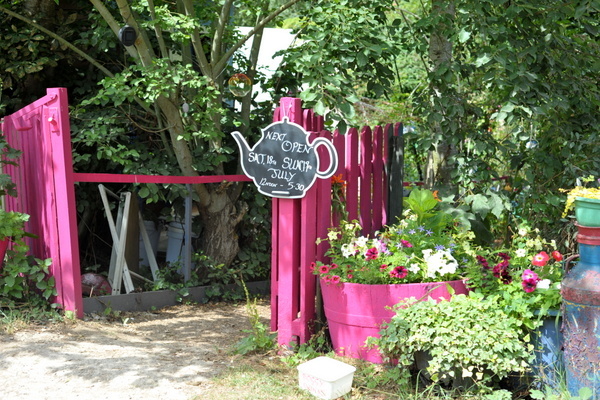 Since we passed Kirtlington a week earlier and hearing listening to a number of enthusiastic comments about a quirky canal-side café, I was really looking forward to visiting Jane’s Enchanted Tea Garden. I walked a mile into Kirtlington on Saturday morning to buy a few essentials from the post office, then sat in the sun in a clearing on the old quarry wharf, day dreaming and reading until the party boats arrived. A stag party, first heard half a mile away, eight strong on each of three hire boats travelling in convoy, weaved across the canal two or three abreast. All wore white tee shirts printed with the text “Dickhead’s Stag Party”. I might not have the exact wording quite right. Most stood on the boat roof, beer bottles in hand, as they chanted and pointed at each other in moronic unity. Then, just as tranquility returned, a day hire boat carrying half a dozen shirtless, white bodied, red faced very drunk middle aged men and their long suffering better halves careered across the canal and crashed into the quarry wharf next to me. They stayed for half an hour for what appeared to be a mainly liquid early lunch eaten, or drunk, while standing on the boat roof, before cannoning off my bow on their way to pastures new. I left the boat at 1pm for what I hoped would be a much more peaceful interlude at Jane’s Enchanted Tea Garden. During my previous day’s walk around the quarry and stroll along the towpath I passed the café entrance. It appeared to be a fairly small, low key kind of place so I was expecting maybe half a dozen occupied tables, but the café web site promising more than a dozen cakes to choose from should have warned me of the business’s popularity. It was heaving with customers. A narrow tree shaded path lead down to the café counter from the pink painted wooden entrance gate. A queue of twenty happily expectant diners waited for twenty minutes to be served. 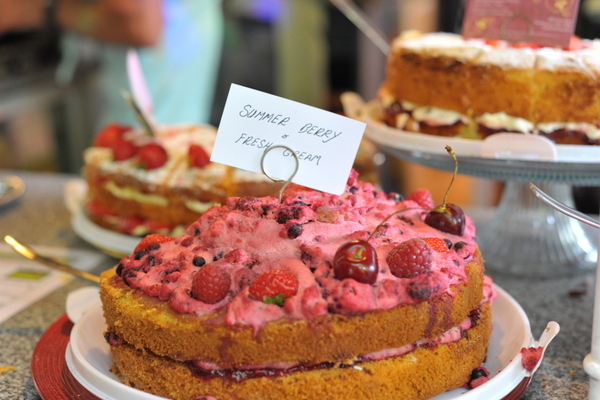 Six uniformed staff peered over racks of home backed cakes and scones cheerfully taking orders. I had already read the menu online so I ordered their Big High Tea, a selection of sandwiches, a couple of home baked scones with cream and jam, and a pot of coffee. I was politely told that I couldn’t have one. The café had taken over 100 pre booked orders for Big High Teas. The guy serving me told me that they didn’t want to run out of stock for those who had already placed orders, but he said that I could choose any of the individual items on display in front of me. A little confused, I ordered a pot of coffee, two homemade scones, a slice of summer berry cake and a prawn sandwich, all the components of their Big High Tea but now costing me £14 instead of £10. Still, the unexpectedly higher price was worth every last penny. There must be seating for over a hundred people in covered marquees, canal-side swing chairs and a variety of mismatched and rather wonky tables. Most were either full or reserved. I walked away from the café building past dove cotes and caged birds, through rose covered arches hung with tea pots and wind chimes before finding a solitary seat between a group of ladies who lunch and couple of aged smiling hippies. The food was divine, the coffee superb and the setting exquisite. I couldn’t have wished for more. Full, and very happy, I returned to the boat fully fuelled for the next leg of my journey. Seven o’clock was approaching by the time I’d made my way through four locks, stopped briefly at Lower Heyford to dispose of a week’s worth of rubbish and found a peaceful spot far away from civilisation and other boats. I really struggle to write my weekly newsletters when I have any form of distraction so the quieter the mooring the better as far as I’m concerned. Imagine my dismay then when, quarter of an hour after I moored, I heard loud screaming and piercing whistles drawing ever closer. A hire boat pulled over immediately behind me. Three shrieking life jacket wearing five year olds leaped off and set up camp on the towpath close to my office window. Call me a miserable, grumpy old git if you like, but my idea of tranquillity does not include high volume querulous children making merry inches away from me. Half a mile further on I found a peaceful spot next to a large open field which was home to a distant heard of cows. Will I never learn? At 8pm, the hundred strong mixed heard wandered over to say hello. They ranged from tiny calves to enormous gentle cows with milk swollen udders. The cows grazed contentedly on the long grass next to the boat, and the calves began licking the cabin sides possibly as a prelude to eating both my rope and cratch cover. I stepped off the front deck to chase the tiny calves away before quickly stepping back on the front deck again when a previously hidden nearby “cow” turned to watch what I was doing. In all departments, he was a very big boy. I sat very quietly behind the cratch cover until he wandered off, then fired up the engine and moved again. Once up through Somerton Deep lock I pulled over at what would have to be my final mooring for the night. At 9pm, in dusk’s failing light, I called it a day. I stayed there until 11am today when, much to my dismay, my lifejacket wearing tormentors from last night visited me again. The same hire boat pulled up in front of me this time, clipping my bow as they pulled in, then discharged their cargo of screaming, whistle blowing lunacy onto the towpath. I moved a quarter of a mile to where I am now, close to lift bridge 193, completely on my own and with a marvellous view. There’s a lively breeze blowing from the stern so I think I’ll stay here for the rest of the day doing very little else than watching the scudding clouds. There’s just one date left now before October. It’s now showing on the calendar so if you want to book 29th July for either a couple or an exclusive single, please let me know. If you want to see the available dates for October onwards click here.